I got hint about this game from Brushy. Download page had note that this game is pretty short. It also appeared to be at least somewhat decent for a TASing purposes ("Road Fighter with lots of violence"). The BIOS/OS versions are identical to #2651: Ilari's DOS Skyroads in 15:55.91. I wait little over 2 frames so first bonus is rockets. I don't waste rockets by firing them to various non-car targets for luck manipulation. After the second "rock section", I go on rampage and destroy loads of vehicles with no regard to ammo nor luck manipulation. The crazy driving is intentional. Its firstly very difficult to drive straight in realtime due to inertia, and secondly just driving straight looks boring, it looks better to drive like drunk and occasionally apply huge steering inputs. 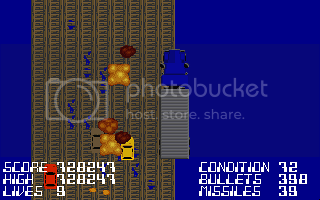 When concentrating fire is done, it is done, and no shot is missed (the shots that appear to "miss" actually connect outside the screen, as evidenced by score increase and explosion scrolling in or vehicle taking "less" damage before blowing up). Nach: For the last couple of seconds this run begins to feel a bit repetitive. Overall though, it's more fun than cow tipping - domino rally style - off a pier. Accepting. sgrunt: This will be published momentarily.